The simple title of this book belies its profundity-and its sense of humor. 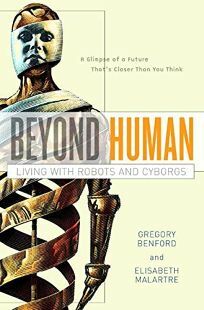 Besides an up-to-date, comprehensive overview of developments in the fields of robotics and artificial intelligence, physicist Benford and biologist Malartre also address deeper questions about the relationship between the brain and the mind, as well as humankind's nervous relationship with increasingly sophisticated machines. Looking at robots' use in all areas, such as unskilled labor, precision work (like surgery), the home and the battlefield, Benford and Malartre take into account not just the latest research and developments, but the long popularity of robots and cyborgs in pop culture (citing movies like A.I. and The Day the Earth Stood Still). Their concluding argument, that consciousness and the intellectual power of the human mind emerge from the complexity of the brain, and thus cannot be reduced to the functioning of its individual components, leads them to doubt, convincingly, that robots (machines that mimic humans) and cyborgs (man-machine hybrids) will ever amount to more than sophisticated tools, enhancing human life but never replacing it. Throughout, the authors maintain a playful sense, an optimistic view of the future and a steady grip on this rapidly expanding field.